The stylish Rexel Promax V60WS Strip-Cut Shredder will shred up to 7 sheets of paper at a time into strips that are 5.8mm wide. Suitable for either home or small office use, this machine has a P-2 security rating so is recommended for everyday shredding rather than the shredding of confidential documents (for these more confidential documents, consider a shredder that shreds material into smaller pieces, e.g. a cross-cut or micro-cut shredder). The Promax V60WS has a good sized 23 litre bin which is capable of holding up to 200 shredded sheets before it needs to be emptied. This large capacity is aided by a unique compaction technology, whereby a compaction plate forces the paper down as the bin fills up. 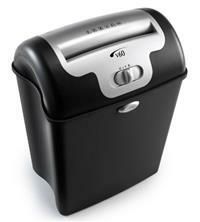 This means the shredder needs less emptying - and you can do more shredding! The shredder also features auto start and stop, an off option and the ability to put the machine into reverse to help clear any paper jams. Throat width is 220mm (A4 size) and this particular shredder does not require lubricant. It will also shred staples and is designed to be quiet in operation. Manufacturer’s warranty on the Rexel Promax V60WS Strip-Cut Shredder is 2 years.